Join Chris Eaton '89, market executive for Merrill Lynch. Chris is responsible for leading the firm’s growth across the ultra-high net worth and institutional client segments. He will speak about internship and job opportunities at Merrill Lynch, as well as how to think about a career in finance more broadly. He'll address how to assess the different kinds of professional tracks in financial services relative to one's own personality so students can better imagine what might be good fits for them. He'll also speak to the liberal arts skills that he honed at Kenyon that are assets in this industry. Chris is currently the market executive of the Buckeye Market in Columbus. He leads the 12 office and 300+ person team that delivers wealth, investment, finance and banking advice in the center of Ohio. Previously he held the same position for the state of Wisconsin as market executive for the Wisconsin Market. Prior to Wisconsin, Chris was a part of the Ohio Valley Market Leadership Team as the associate market executive/resident director, responsible for managing the fifth largest complex at Merrill Lynch. 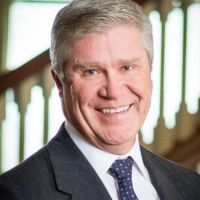 His primary responsibilities were the management of the Advisor Training Program, retention and recruiting of advisors, leadership of the Dayton office, and numerous sales initiatives. Before Chris moved to the market executive role in 2012, he was the Merrill Lynch Trust Specialist for Ohio, helping financial advisors assist their clients with all manners of trust, estate and charitable planning, as well as helping not-for-profit institutions manage their endowments. Chris earned a bachelor's degree from Kenyon, with further graduate work at the University of Pennsylvania and the Northern Kentucky University Chase School of Law. Additionally, he is a certified trust and financial advisor, certified financial planner and holds numerous FINRA licenses. He is also a past member of the Cincinnati Estate Planning Council. Chris has been involved in numerous civic and charitable endeavors: he is a past board member of Cincinnati Habitat for Humanity, Indian Hill Recreation Commission, Cincinnati Hills Say Soccer, and a past board member of the WI Juvenile Diabetes Research Foundation. He is a member of the leadership committee for Kenyon's current comprehensive campaign, Our Path Forward, an executive committee member of the Columbus American Heart Association, and board electee for the Central Ohio JDRF chapter. Chris is married with two children and resides in the Powell area.